Second day on Mars we woke up with the smell of scrambled eggs and spam and self-made brownies that we prepared last night. As a lesson learned we started to prepare earlier today for the morning EVA to collect rock samples. The EVA 1 crew: Nathan, Daniel, Natalia and Maria left the hab at 0930AM. First, EVA1 crew took some pictures with signs for outreach before heading to the White Moon area using the rovers Spirit and Opportunity. The road was windy, and every corner revealed a new area of Mars. Opportunity rover was doing great whereas the Spirit rover concerned EVA1 crew more, as the State of Charge seems to be dropping fast. Therefore, EVA1 had to stop earlier than planned to start walking by foot and leave the rovers behind. Finding the White Moon seems to be more challenging than earlier EVAs as the road was not properly marked and the helmets of the space suits kept fogging and limiting visibility. 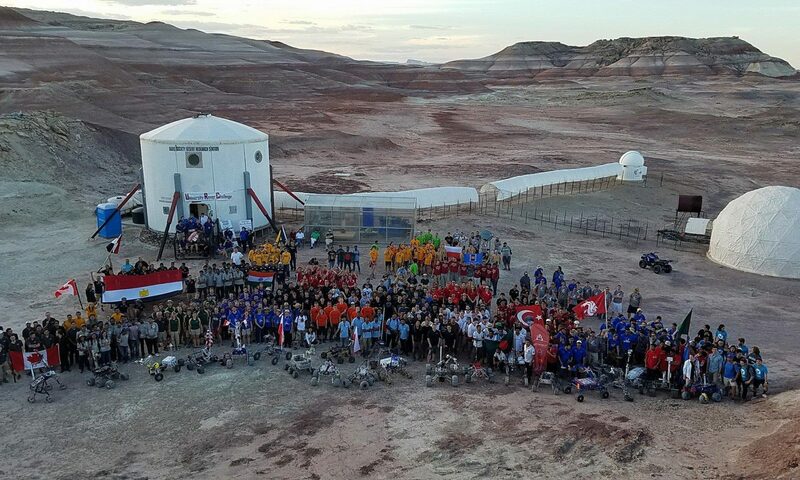 EVA1 lost communication with the hab because they were out of reach of the communication system, which added more challenges. During this walk the blazing Sun revealed shimmers and flashes of light from the crews´ visors that were actually shiny rocks (believed to be quartz containing crystals) underneath their feet. They stopped to retrieve these jewels in the desert as their first sample of the day. EVA1 crew kept on walking, stopping from time to time to figure out where they actually were until they arrived at their desired location: White Moon. The white soil of the hill they stopped on let us guess why they called it the Moon. Small stains of red underneath the chalk-white hill intrigued the crew, and a short hit with the hammer revealed a bright red soil underneath. Described as a geological “red velvet cake”, it was great for their samples. The curiosity kept running through EVA1 crew veins and let them keep moving anuntil they found crevice. Everyone of that EVA got so excited as this indicated that there had been water running through this land a long time ago. Two crew members climbed down into the crevice to take samples of the different sediments. While EVA1 were busy in the White Moon, the rest of the crew were busy working in the hab. The crew astronomer was busy working on photometry and setting up new observation for tonight. Work in the GreenHab was also ongoing by watering the plants and making sure everything is in place. Pumped up with excitement of their discoveries, the crew went back towards the hab where the support crew welcomed them with a hot chicken soup. Just one hour later after EVA1 crew arrived EVA2 crew was about to get ready. During the preparation it was clear that not all space suits are working properly, and we are unclear on how long they have to be charged before being used again. As there were not enough spare suits that not had been used before, or where the fans are running properly, the commander came to the decision that the EVA2 has to be scrubbed. It was a tough call but Safety first. Mars is not easy it is hard. We have to keep more focus on the maintenance of the habitat while being focused on our personal goals. Still the crew found time for their first yoga sessions and preparing for the Martian Spanish night with tapas and Spanish jamón. Tomorrow we will be planning for two EVAs again and making sure to keep checking and preparing accordingly.